“I have shot recurves pretty much all my life. My father introduced me to traditional archery as a young boy and Paul Schafer reinforced my love for the sport by building me my first recurve. I have been a die hard recurve shooter ever since and have to say that building a longbow was not of great interest to me. I personally found them difficult to shoot, a real challenge for me to say the least. When experimenting with various designs I realized that there was an alternative to the traditional style longbow which would allow those like myself to enjoy the renaissance and simplicity of what longbows had to offer without sacrificing the performance I had grown accustom to with the recurves. I believe I’ve combined the overall shootability of the recurve with the traditional, sleek looks of the longbow to create what is a high performing well shooting longbow". The Silvertip one-piece longbow is offered in 64” and 66” lengths. The bow has a reflex/deflex design which offers high speed performance, minimal handshock and exceptional stability. The locator grip makes for consistent hand placement and comfort each and every time you shoot . The sight window is cut to center allowing you to use a wider range of arrow spines thus illuminating the hassles many experience when tuning their bow. 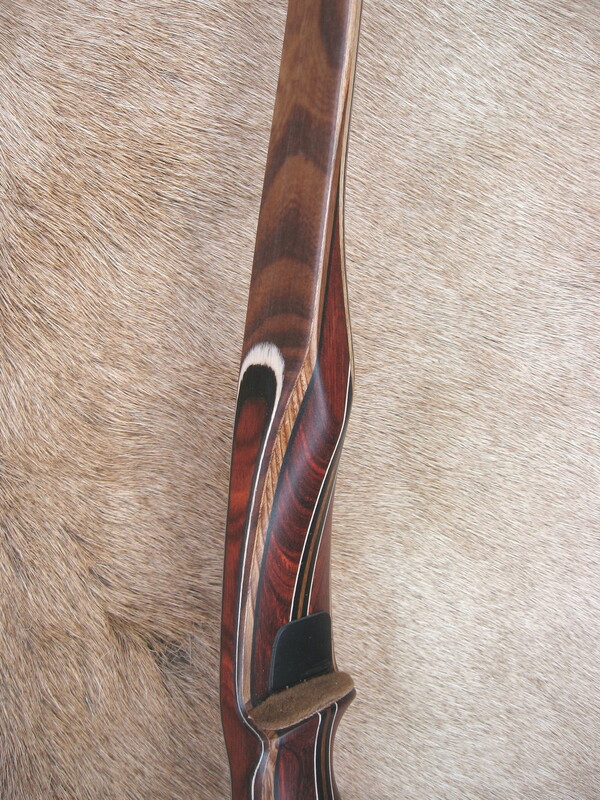 A center shot design also allows a bow to naturally point well. The riser wood I am offering is Dymondwood available in a walnut, rosewood or charcoal stain. Dymondwood is a laminated birch that is densely impregnated with resins and dyes. This riser material provides tremendous durability and a slightly heavier physical weight bow, adding stability and reducing hand shock. Each Silvertip longbow comes standard with a slightly radiused laminated accent stripe for strength. We also offer other riser configurations which you can view in the "Custom Options" tab. All Silvertip longbows are built to accommodate Fast Flight, therefore all risers must be made from the standard Dymondwood. If you wish to incorporate exotics into your One-Piece longbow, you may do so only in the center stripe or in the center of one of our custom riser lay-ups. Always keeping the Dymondwood on the outer portion of the riser is our goal. Decorative overlays are used on the target side of the riser to compliment the various woods you have chosen. 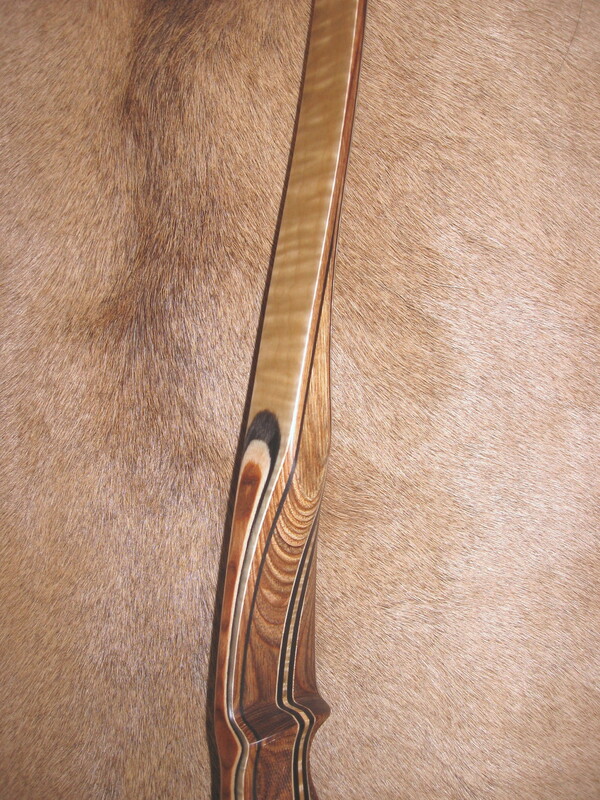 The standard limb core on the longbow is built with Actionwood. Actionwood is a laminated maple that is extremely consistent thus ensuring great efficiency, stability and smoothness in the limb. Longbows have an abundance of wood vs. glass which is why a durable and consistent would like Actionwood is preferred. In addition to the Actionwood core, there are many exotic veneer options you can chose from all of which will offer the same superior performance. Some common examples of these are Zebrawood, Red Elm, Shedua, Juniper, Osage, Yew, Russian Olive and Curly Maple. These exotic veneers laminated under clear glass are strictly for aesthetics and do not affect the performance of the limb design. The standard tip overlay is wood to match the handle color chosen. Antler and various horn tip overlays are additional options you can choose from. All Silvertip longbows, regardless of the overlay material chosen are built to accommodate Fast Flight. I offer the locator style grip as my standard. 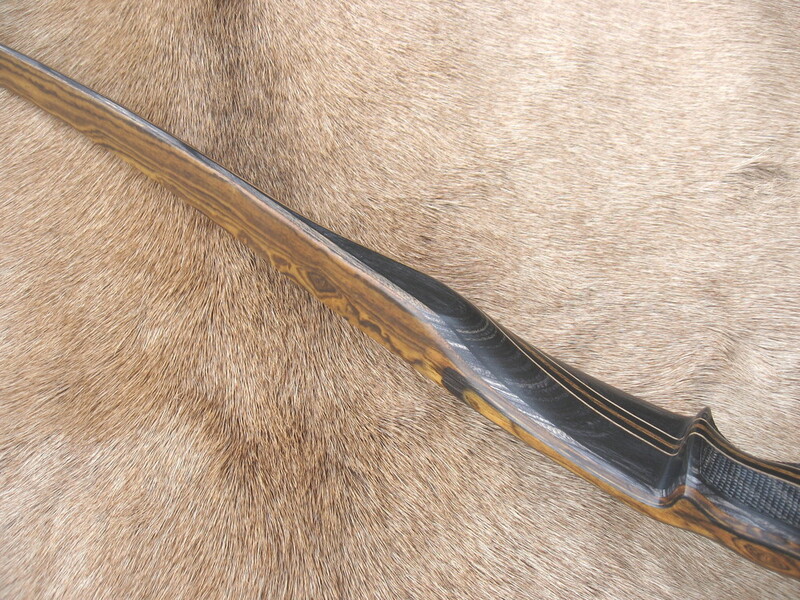 If you have modifications you would like to make to the grip I would be happy to work with you providing the specifications are adaptable to the overall design of the bow. Including a trace of your hand with your order will help determine the proper fit for you. The checkering has proven to be the most popular option among the recurves, and in wet or humid conditions it is an option I recommend on the longbows as well. A Fast Flight string, Selway stringer, shelf material and information sheet is included with each longbow.